Lockheed's previous reconnaissance aircraft was the relatively slow U-2, designed for the Central Intelligence Agency (CIA). In late 1957, the CIA approached the defense contractor Lockheed to build an undetectable spy plane. The project, named Archangel, was led by Kelly Johnson, head of Lockheed's Skunk Works unit in Burbank, California. The work on project Archangel began in the second quarter of 1958, with aim of flying higher and faster than the U-2. Of 11 successive designs drafted in a span of 10 months, "A-10" was the frontrunner. Despite this, however, its shape made it vulnerable to radar detection. After a meeting with the CIA in March 1959, the design was modified to have a 90% reduction in radar cross-section. The CIA approved a US$96 million contract for Skunk Works to build a dozen spy planes, named "A-12" on 11 February 1960. The 1960 downing of Francis Gary Powers's U-2 underscored its vulnerability and the need for faster reconnaissance aircraft such as the A-12. The A-12 first flew at Groom Lake (Area 51), Nevada, on 25 April 1962. 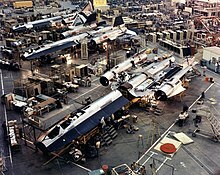 Thirteen were built; two variants were also developed, including three of the YF-12 interceptor prototype, and two of the M-21 drone carrier. The aircraft was meant to be powered by the Pratt & Whitney J58 engine, but development ran over schedule, and it was equipped instead with the less powerful Pratt & Whitney J75 initially. The J58s were retrofitted as they became available, and became the standard powerplant for all subsequent aircraft in the series (A-12, YF-12, M-21), as well as the SR-71. The A-12 flew missions over Vietnam and North Korea before its retirement in 1968. The program's cancellation was announced on 28 December 1966, due both to budget concerns and because of the forthcoming SR-71, a derivative of the A-12. The SR-71 designation is a continuation of the pre-1962 bomber series; the last aircraft built using the series was the XB-70 Valkyrie. However, a bomber variant of the Blackbird was briefly given the B-71 designator, which was retained when the type was changed to SR-71. During the later stages of its testing, the B-70 was proposed for a reconnaissance/strike role, with an "RS-70" designation. When the A-12 performance potential clearly was found to be much greater, the Air Force ordered a variant of the A-12 in December 1962. Originally named R-12[N 1] by Lockheed, the Air Force version was longer and heavier than the A-12, with a longer fuselage to hold more fuel, two seats in the cockpit, and reshaped chines. Reconnaissance equipment included signals intelligence sensors, a side-looking airborne radar, and a photo camera. The CIA's A-12 was a better photo-reconnaissance platform than the Air Force's R-12, since the A-12 flew somewhat higher and faster, and with only one pilot, it had room to carry a superior camera and more instruments. During the 1964 campaign, Republican presidential nominee Barry Goldwater repeatedly criticized President Lyndon B. Johnson and his administration for falling behind the Soviet Union in developing new weapons. Johnson decided to counter this criticism by revealing the existence of the YF-12A Air Force interceptor, which also served as cover for the still-secret A-12 and the Air Force reconnaissance model since July 1964. Air Force Chief of Staff General Curtis LeMay preferred the SR (Strategic Reconnaissance) designation and wanted the RS-71 to be named SR-71. Before the July speech, LeMay lobbied to modify Johnson's speech to read SR-71 instead of RS-71. The media transcript given to the press at the time still had the earlier RS-71 designation in places, creating the story that the president had misread the aircraft's designation. [N 2] Johnson only referred to the A-11 to conceal the A-12, while revealing that there was a high speed, high altitude reconnaissance aircraft. In 1968, Secretary of Defense Robert McNamara cancelled the F-12 interceptor program; the specialized tooling used to manufacture both the YF-12 and the SR-71 was also ordered destroyed. Production of the SR-71 totaled 32 aircraft with 29 SR-71As, two SR-71Bs, and the single SR-71C. While the SR-71 carried radar countermeasures to evade interception efforts, its greatest protection was its combination of high altitude and very high speed, which made it almost invulnerable. Along with its low radar cross-section, these qualities gave a very short time for an enemy surface-to-air missile (SAM) site to acquire and track the aircraft on radar. By the time the SAM site could track the SR-71, it was often too late to launch a SAM, and the SR-71 would be out of range before the SAM could catch up to it. If the SAM site could track the SR-71 and fire a SAM in time, the SAM would expend nearly all of the delta-v of its boost and sustainer phases just reaching the SR-71's altitude; at this point, out of thrust, it could do little more than follow its ballistic arc. Merely accelerating would typically be enough for an SR-71 to evade a SAM; changes by the pilots in the SR-71's speed, altitude, and heading were also often enough to spoil any radar lock on the plane by SAM sites or enemy fighters. At sustained speeds of more than Mach 3.2, the plane was faster than the Soviet Union's fastest interceptor, the Mikoyan-Gurevich MiG-25, which also could not reach the SR-71's altitude. During its service life, no SR-71 was shot down. On most aircraft, use of titanium was limited by the costs involved; it was generally used only in components exposed to the highest temperatures, such as exhaust fairings and the leading edges of wings. On the SR-71, titanium was used for 85% of the structure, with much of the rest polymer composite materials. To control costs, Lockheed used a more easily worked titanium alloy which softened at a lower temperature. [N 3] The challenges posed led Lockheed to develop new fabrication methods, which have since been used in the manufacture of other aircraft. Lockheed found that washing welded titanium requires distilled water, as the chlorine present in tap water is corrosive; cadmium-plated tools could not be used, as they also caused corrosion. Metallurgical contamination was another problem; at one point, 80% of the delivered titanium for manufacture was rejected on these grounds. The high temperatures generated in flight required special design and operating techniques. Major portions of the skin of the inboard wings were corrugated, not smooth. Aerodynamicists initially opposed the concept, disparagingly referring to the aircraft as a Mach 3 variant of the 1920s-era Ford Trimotor, known for its corrugated aluminum skin. The heat would have caused a smooth skin to split or curl, whereas the corrugated skin could expand vertically and horizontally and had increased longitudinal strength. The outer windscreen of the cockpit was made of quartz and was fused ultrasonically to the titanium frame. The temperature of the exterior of the windscreen reached 600 °F (316 °C) during a mission. Cooling was carried out by cycling fuel behind the titanium surfaces in the chines. On landing, the canopy temperature was over 300 °C (572 °F). The Blackbird's tires, manufactured by B.F. Goodrich, contained aluminum and were filled with nitrogen. They cost $2,300 and would generally require replacing within 20 missions. The Blackbird landed at over 170 knots (200 mph; 310 km/h) and deployed a drag parachute to stop; the chute also acted to reduce stress on the tires. The second operational aircraft designed around a stealth aircraft shape and materials, after the Lockheed A-12, the SR-71 had several features designed to reduce its radar signature. The SR-71 had a radar cross-section (RCS) around 110 sq ft (10 m2). Drawing on early studies in radar stealth technology, which indicated that a shape with flattened, tapering sides would reflect most energy away from a radar beam's place of origin, engineers added chines and canted the vertical control surfaces inward. Special radar-absorbing materials were incorporated into sawtooth-shaped sections of the aircraft's skin. Cesium-based fuel additives were used to somewhat reduce exhaust plumes visibility to radar, although exhaust streams remained quite apparent. Kelly Johnson later conceded that Soviet radar technology advanced faster than the stealth technology employed against it. The SR-71 featured chines, a pair of sharp edges leading aft from either side of the nose along the fuselage. These were not a feature on the early A-3 design; Frank Rodgers, a doctor at the Scientific Engineering Institute, a CIA front organization, discovered that a cross-section of a sphere had a greatly reduced radar reflection, and adapted a cylindrical-shaped fuselage by stretching out the sides of the fuselage. After the advisory panel provisionally selected Convair's FISH design over the A-3 on the basis of RCS, Lockheed adopted chines for its A-4 through A-6 designs. The air inlets allowed the SR-71 to cruise at over Mach 3.2, while keeping airflow into the engines at the initial subsonic speeds. Mach 3.2 was the design point for the aircraft, its most efficient speed. However, in practice the SR-71 was sometimes more efficient at even faster speeds—depending on the outside air temperature—as measured by pounds of fuel burned per nautical mile traveled. During one mission, SR-71 pilot Brian Shul flew faster than usual to avoid multiple interception attempts; afterwards, it was discovered that this had reduced fuel consumption. At the front of each inlet, a pointed, movable cone called a "spike" (inlet cone) was locked in its full forward position on the ground and during subsonic flight. When the aircraft accelerated past Mach 1.6, an internal jackscrew moved the spike up to 26 in (66 cm) inwards, directed by an analog air inlet computer that took into account pitot-static system, pitch, roll, yaw, and angle of attack. Moving the spike tip drew the shock wave riding on it closer to the inlet cowling until it touched just slightly inside the cowling lip. This position reflected the spike shock wave repeatedly between the spike center body and the inlet inner cowl sides, and minimized airflow spillage which is the cause of spillage drag. The air slowed supersonically with a final plane shock wave at entry to the subsonic diffuser. The SR-71 was powered by two Pratt & Whitney J58 (company designation JT11D-20) axial-flow turbojet engines. The J58 was a considerable innovation of the era, capable of producing a static thrust of 32,500 lbf (145 kN). The engine was most efficient around Mach 3.2, the Blackbird's typical cruising speed. At lower speeds, the turbojet provided most of the compression. At higher speeds, the engine largely ceased to provide thrust, the afterburner taking its place. Air was initially compressed (and heated) by the inlet spike and subsequent converging duct between the center body and inlet cowl. The shock waves generated slowed the air to subsonic speeds relative to the engine. The air then entered the engine compressor. 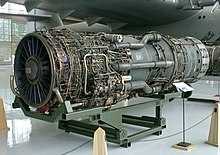 Some of this compressor flow (20% at cruise) was removed after the fourth compressor stage and went straight to the afterburner through six bypass tubes. 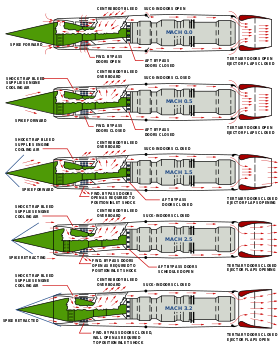 Air passing through the turbojet was compressed further by the remaining five compressor stages and then fuel was added in the combustion chamber. After passing through the turbine, the exhaust, together with the compressor bleed air, entered the afterburner. Originally, the Blackbird's J58 engines were started with the assistance of two Buick Wildcat V8 internal combustion engines, externally mounted on a vehicle referred to as an AG330 "start cart". The start cart was positioned underneath the J58 and the two Buick engines powered a single, vertical drive shaft connecting to the J58 engine and spinning it to above 3,200 RPM, at which point the turbojet could self-sustain. Once the first J58 engine was started, the cart was repositioned to start the aircraft's other J58 engine. Later start carts used Chevrolet big-block V8 engines. Eventually, a quieter, pneumatic start system was developed for use at main operating bases. The V8 start carts remained at diversion landing sites not equipped with the pneumatic system. Several exotic fuels were investigated for the Blackbird. Development began on a coal slurry power plant, but Johnson determined that the coal particles damaged important engine components. Research was conducted on a liquid hydrogen powerplant, but the tanks for storing cryogenic hydrogen were not of a suitable size or shape. In practice, the Blackbird would burn somewhat conventional JP-7, which was difficult to light. To start the engines, triethylborane (TEB), which ignites on contact with air, was injected to produce temperatures high enough to ignite the JP-7. The TEB produced a characteristic green flame, which could often be seen during engine ignition. On a typical SR-71 mission, the airplane took off with only a partial fuel load to reduce stress on the brakes and tires during takeoff and also ensure it could successfully take off should one engine fail. As a result, the SR-71s were typically refueled immediately after takeoff. The SR-71 also required in-flight refueling to replenish fuel during long-duration missions. Supersonic flights generally lasted no more than 90 minutes before the pilot had to find a tanker. Specialized KC-135Q tankers were required to refuel the SR-71. The KC-135Q had a modified high-speed boom, which would allow refueling of the Blackbird at nearly the tanker's maximum airspeed with minimum flutter. The tanker also had special fuel systems for moving JP-4 (for the KC-135Q itself) and JP-7 (for the SR-71) between different tanks. As an aid to the pilot when refueling, the cockpit was fitted with a peripheral vision horizon display. This unusual instrument projected a barely visible artificial horizon line across the top of the entire instrument panel, which gave the pilot subliminal cues on aircraft attitude. Before takeoff, a primary alignment brought the ANS's inertial components to a high degree of accuracy. In flight, the ANS, which sat behind the reconnaissance systems officer's (RSO's), position, tracked stars through a circular quartz glass window on the upper fuselage. Its "blue light" source star tracker, which could see stars during both day and night, would continuously track a variety of stars as the aircraft's changing position brought them into view. The system's digital computer ephemeris contained data on a list of stars used for celestial navigation: the list first included 56 stars, and was later expanded to 61. The ANS could supply altitude and position to flight controls and other systems, including the mission data recorder, automatic navigation to preset destination points, automatic pointing and control of cameras and sensors, and optical or SLR sighting of fixed points loaded into the ANS before takeoff. According to Richard Graham, a former SR-71 pilot, the navigation system was good enough to limit drift to 1,000 ft (300 m) off the direction of travel at Mach 3. The SR-71 originally included optical/infrared imagery systems; side-looking airborne radar (SLAR); electronic intelligence (ELINT) gathering systems; defensive systems for countering missile and airborne fighters; and recorders for SLAR, ELINT, and maintenance data. The SR-71 carried a Fairchild tracking camera and an infrared camera, both of which ran during the entire mission. 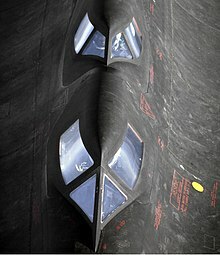 As the SR-71 had a second cockpit behind the pilot for the RSO, it could not carry the A-12's principal sensor, a single large-focal-length optical camera that sat in the "Q-Bay" behind the A-12's single cockpit. 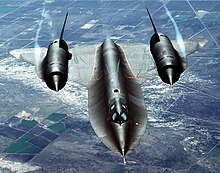 Instead, the SR-71's camera systems could be located either in the fuselage chines or the removable nose/chine section. Wide-area imaging was provided by two of Itek's Operational Objective Cameras, which provided stereo imagery across the width of the flight track, or an Itek Optical Bar Camera, which gave continuous horizon-to horizon coverage. A closer view of the target area was given by the HYCON Technical Objective Camera (TEOC), that could be directed up to 45° left or right of the centerline. Initially, the TEOCs could not match the resolution of the A-12's larger camera, but rapid improvements in both the camera and film improved this performance. SLAR, built by Goodyear Aerospace, could be carried in the removable nose. In later life, the radar was replaced by Loral's Advanced Synthetic Aperture Radar System (ASARS-1). Both the first SLAR and ASARS-1 were ground-mapping imaging systems, collecting data either in fixed swaths left or right of centerline or from a spot location for higher resolution. ELINT-gathering systems, called the Electro Magnetic Reconnaissance System, built by AIL could be carried in the chine bays to analyse electronic signal fields being passed through, and were programmed to identify items of interest. Over its operational life, the Blackbird carried various electronic countermeasures (ECMs), including warning and active electronic systems built by several ECM companies and called Systems A, A2, A2C, B, C, C2, E, G, H, and M. On a given mission, an aircraft carried several of these frequency/purpose payloads to meet the expected threats. Major Jerry Crew, an RSO, told Air & Space/Smithsonian that he used a jammer to try to confuse surface-to-air missile sites as their crews tracked his airplane, but once his threat-warning receiver told him a missile had been launched, he switched off the jammer to prevent the missile from homing in on its signal. After landing, information from the SLAR, ELINT gathering systems, and the maintenance data recorder were subjected to postflight ground analysis. In the later years of its operational life, a datalink system could send ASARS-1 and ELINT data from about 2,000 nmi (3,700 km) of track coverage to a suitably equipped ground station. Flying at 80,000 ft (24,000 m) meant that crews could not use standard masks, which could not provide enough oxygen above 43,000 ft (13,000 m). Specialized protective pressurized suits were produced for crew members by the David Clark Company for the A-12, YF-12, M-21 and SR-71. Furthermore, an emergency ejection at Mach 3.2 would subject crews to temperatures of about 450 °F (230 °C); thus, during a high-altitude ejection scenario, an onboard oxygen supply would keep the suit pressurized during the descent. The cockpit could be pressurized to an altitude of 10,000 or 26,000 ft (3,000 or 8,000 m) during flight. The cabin needed a heavy-duty cooling system, as cruising at Mach 3.2 would heat the aircraft's external surface well beyond 500 °F (260 °C) and the inside of the windshield to 250 °F (120 °C). An air conditioner used a heat exchanger to dump heat from the cockpit into the fuel prior to combustion. The same air-conditioning system was also used to keep the front (nose) landing gear bay cool, thereby eliminating the need for the special aluminum-impregnated tires similar to those used on the main landing gear. The first flight of an SR-71 took place on 22 December 1964, at Air Force Plant 42 in Palmdale, California. The SR-71 reached a top speed of Mach 3.4 during flight testing, with pilot Major Brian Shul reporting a speed of Mach 3.5 on an operational sortie while evading a missile over Libya. The first SR-71 to enter service was delivered to the 4200th (later, 9th) Strategic Reconnaissance Wing at Beale Air Force Base, California, in January 1966. European operations were from RAF Mildenhall, England. There were two routes. One was along the Norwegian west coast and up the Kola Peninsula, which contained several large naval bases belonging to the Soviet Navy's Northern Fleet. Over the years, there were several emergency landings in Norway, four in Bodø and two of them in 1981 (flying from Beale) and 1985. Rescue parties were sent in to repair the planes before leaving. On one occasion, one complete wing with engine was replaced as the easiest way to get the plane airborne again. The other route, from Mildenhall over the Baltic Sea, was known as the Baltic Express. Swedish Air Force fighter pilots have managed to lock their radar on an SR-71 on multiple occasions within shooting range. [clarification needed] Target illumination was maintained by feeding target location from ground-based radars to the fire-control computer in the JA 37 Viggen interceptor. The most common site for the lock-on was the thin stretch of international airspace between Öland and Gotland that the SR-71s used on their return flights. The SR-71, while much more capable than the Lockheed U-2 in terms of range, speed, and survivability, suffered the lack of a data link, which the U-2 had been upgraded to carry. This meant that much of the SR-71's imagery and radar data could not be used in real time, but had to wait until the aircraft returned to base. This lack of immediate real-time capability was used as one of the justifications to close down the program. Attempts to add a datalink to the SR-71 were stymied early on by the same factions in the Pentagon and Congress who were already set on the program's demise, even in the early 1980s. These same factions also forced expensive sensor upgrades to the SR-71, which did little to increase its mission capabilities, but could be used as justification for complaining about the cost of the program. —  Response from Admiral Richard C. Macke to the Senate Committee on Armed Services. Due to unease over political situations in the Middle East and North Korea, the U.S. Congress re-examined the SR-71 beginning in 1993. Rear Admiral Thomas F. Hall addressed the question of why the SR-71 was retired, saying it was under "the belief that, given the time delay associated with mounting a mission, conducting a reconnaissance, retrieving the data, processing it, and getting it out to a field commander, that you had a problem in timelines that was not going to meet the tactical requirements on the modern battlefield. And the determination was that if one could take advantage of technology and develop a system that could get that data back real time... that would be able to meet the unique requirements of the tactical commander." Hall also stated they were "looking at alternative means of doing [the job of the SR-71]." Congress's disappointment with the lack of a suitable replacement for the Blackbird was cited concerning whether to continue funding imaging sensors on the U-2. Congressional conferees stated the "experience with the SR-71 serves as a reminder of the pitfalls of failing to keep existing systems up-to-date and capable in the hope of acquiring other capabilities." It was agreed to add $100 million to the budget to return three SR-71s to service, but it was emphasized that this "would not prejudice support for long-endurance UAVs [such as the Global Hawk]." The funding was later cut to $72.5 million. The Skunk Works was able to return the aircraft to service under budget at $72 million. 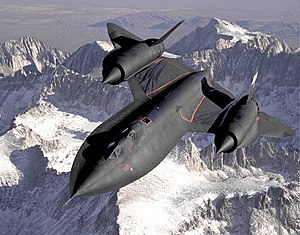 NASA operated the two last airworthy Blackbirds until 1999. All other Blackbirds have been moved to museums except for the two SR-71s and a few D-21 drones retained by the NASA Dryden Flight Research Center (later renamed the Armstrong Flight Research Center). The SR-71 was the world's fastest and highest-flying operational manned aircraft throughout its career. On 28 July 1976, SR-71 serial number 61-7962, piloted by then Captain Robert Helt, broke the world record: an "absolute altitude record" of 85,069 feet (25,929 m). Several aircraft have exceeded this altitude in zoom climbs, but not in sustained flight. That same day SR-71 serial number 61-7958 set an absolute speed record of 1,905.81 knots (2,193.2 mph; 3,529.6 km/h), approximately Mach 3.3. 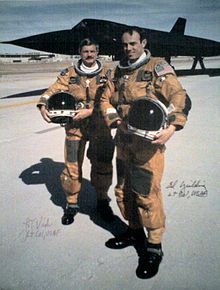 SR-71 pilot Brian Shul states in his book The Untouchables that he flew in excess of Mach 3.5 on 15 April 1986 over Libya to evade a missile. The SR-71 also holds the "speed over a recognized course" record for flying from New York to London—distance 3,461.53 miles (5,570.79 km), 1,806.964 miles per hour (2,908.027 km/h), and an elapsed time of 1 hour 54 minutes and 56.4 seconds—set on 1 September 1974, while flown by U.S. Air Force pilot James V. Sullivan and Noel F. Widdifield, reconnaissance systems officer (RSO). This equates to an average speed of about Mach 2.72, including deceleration for in-flight refueling. Peak speeds during this flight were likely closer to the declassified top speed of over Mach 3.2. For comparison, the best commercial Concorde flight time was 2 hours 52 minutes and the Boeing 747 averages 6 hours 15 minutes. On 26 April 1971, 61-7968, flown by majors Thomas B. Estes and Dewain C. Vick, flew over 15,000 miles (24,000 km) in 10 hours and 30 minutes. This flight was awarded the 1971 Mackay Trophy for the "most meritorious flight of the year" and the 1972 Harmon Trophy for "most outstanding international achievement in the art/science of aeronautics". Speculation existed regarding a replacement for the SR-71, including a rumored aircraft codenamed Aurora. The limitations of reconnaissance satellites, which take up to 24 hours to arrive in the proper orbit to photograph a particular target, make them slower to respond to demand than reconnaissance planes. The fly-over orbit of spy satellites may also be predicted and can allow assets to be hidden when the satellite is above, a drawback not shared by aircraft. Thus, there are doubts that the US has abandoned the concept of spy planes to complement reconnaissance satellites. Unmanned aerial vehicles (UAVs) are also used for much aerial reconnaissance in the 21st century, being able to overfly hostile territory without putting human pilots at risk, as well as being smaller and harder to detect than man-carrying aircraft. On 1 November 2013, media outlets reported that Skunk Works has been working on an unmanned reconnaissance airplane it has named SR-72, which would fly twice as fast as the SR-71, at Mach 6. However, the Air Force is officially pursuing the Northrop Grumman RQ-180 UAV to take up the SR-71's strategic ISR role. After completion of all USAF and NASA SR-71 operations at Edwards AFB, the SR-71 Flight Simulator was moved in July 2006 to the Frontiers of Flight Museum at Love Field Airport in Dallas, Texas. McIninch, Thomas. "The Oxcart Story". Center for the Study of Intelligence, Central Intelligence Agency, 2 July 1996. Retrieved: 10 April 2009.